At LCS Constructors, our lab design services provide you with the technical facilities you need to research, create, and innovate. Whatever you do in your lab is important, and even the accidents can offer amazing results. 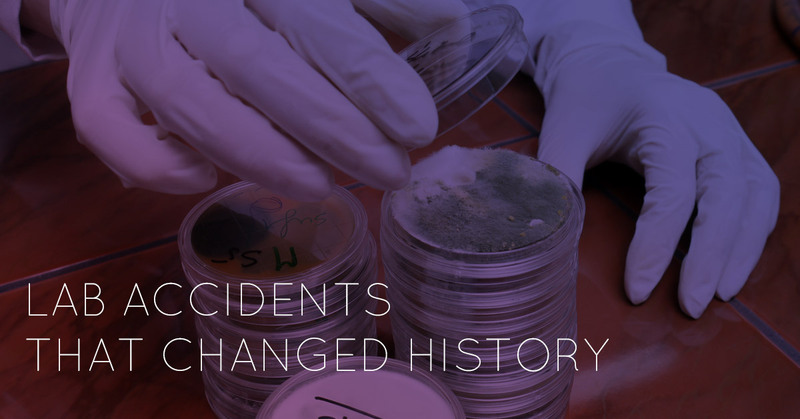 In this blog, we will go over some incidents in labs that may have happened by accident, but changed history. One of the most famous examples of a lab accident gone right is the discovery of penicillin. Penicillin is a category of antibiotics that are used to fight a wide variety of infections. In the 1920s, Scottish scientist Alexander Fleming was working in his lab studying staphylococci, also known as staph infection, when he decided to take a summer vacation. When he returned on September 3, 1928, the staph culture he had left had grown an unknown fungus on it which killed the bacteria around it. This laboratory accident had a transformative impact on modern medicine. Teflon, the material that makes your frying pan non-stick, was invented in 1938 by Roy Plunkett. Plunkett was working to replace the refrigerant in refrigerators to be made out of less dangerous materials. One day, he opened a container of a sample he was working on, and found that the gas inside was gone. Instead, there was a peculiar resin left behind, a resin that proved to be heat and chemical resistant. Teflon was first used by the Manhattan project in the ‘40s; it wasn’t until the ‘60s that it was used for its current most popular function: nonstick cookware. Smart Dust, tiny self-assembling particles that are on the horizon of revolutionizing a number of industries, was invented by accident in a lab. At the University of California, San Diego in the 1990s, Jamie Link, a chemistry grad student, accidentally shattered a silicon chip. She discovered that even though it was in pieces, the tiny bits were still operating. This led them to adopt the term “smart dust” and started the development of this piece of technology that is set to be revolutionary for the military, medical community, and more. Rubber was a popular material for shoes in the 1830s, but it was unable to withstand extremes in temperature. This made many people believe that rubber would soon go out of style, but Charles Goodyear was determined to make rubber a more durable material. Though he spent years searching for a solution, he came upon it completely by accident. In 1839, he accidentally dropped his latest attempt on a hot stove. What was left was a leather-like substance, a weatherproof version of rubber. Though he never saw this pay off in his lifetime, 40 years after his death, the famous tire and rubber company would be named after the accidental inventor of vulcanized rubber. You probably take your microwave for granted, but when you next need to heat up leftovers, thank Percy Spencer for his mistake. An American engineer for Raytheon was in the lab when he walked by a magnetron and found that his chocolate bar, which was in his pocket, had melted. In 1945, Spencer began experimenting with creating the microwave oven using the magnetron technology. While he was successful, the initial design was too bulky to be sold commercially. It wasn’t until 1967 that people began buying the smaller, sleeker microwave ovens that came out. The Big Bang Theory is the most prominent theory on how the universe was created, and it was developed by accident. Astronomers Robert Wilson and Arno Penzias were working on the Holmdel antenna in New Jersey when they started to hear a strange noise that they could not identify. They eliminated a variety of possible sources, including nuclear tests, urban noise, or even pigeons, and identified an explanation using Robert Dicke’s theory that leftover radiation from the Big Bang would cause background radiation. It was fewer than 40 miles away at Princeton University that Dicke was looking for exactly this background radiation. Wilson and Penzias inadvertently found it before him, leading to them both winning the Nobel Prize for their discovery. You may have assumed that Coca-Cola was created by an confectioner or at least a businessman, but it was actually a pharmacist experimenting in his lab. John Pemberton was looking for a cure for headaches when he inadvertently created the carbonated beverage sold everywhere in the world today. In his efforts, Pemberton mixed together coca leaves and kola nuts when a lab assistant inadvertently mixed them with seltzer water. While the Coca-Cola company would change the formula over the years, it was this initial lab mistake that could give them the inspiration for the famous beverage. Unfortunately, Pemberton passed away only two years later, so he never saw exactly what happened with his accidental invention. You may wish for only sunny days, but bad weather can lead to some intriguing revelations. For example, in 1896, scientist Henri Becquerel was experimenting with an uranium-enriched crystal. His theory was that sunlight was integral to the crystal burning its image into a photographic plate. However, clouds interrupted his work, causing him to pack up and decide to finish his work when the sun came out again. A couple of days later, he pulled the crystal out of the drawer, and found that the burned image was “fogged.” It appeared that rays emitted from the crystal were responsible for the fogged plate, but were not taken seriously as they were considered weaker than the x-ray. While he did not name the phenomenon at the time, Pierre and Marie Curie would later. If you have used a Post-it Note, the small piece of paper with an adhesive on the back that allows you temporarily attach them to pretty much anything you want, you have an accident to thank for this handy invention. In 1968, 3M employee Spencer Silver inadvertently invented an adhesive that seemed to have no use. That is, until coworker Arthur Fry was looking for a way to hold bookmarks in his hymnal in 1974. In 1980, after being initially skeptical of the product, 3M put Post-It Notes on the market. Today, they are sold all over the world. When you need lab design, contact LCS Constructors. We work with lab owners in a variety of industries to ensure that they have the facilities they need, as well as our on-going support. Contact LCS Constructors for lab design today!